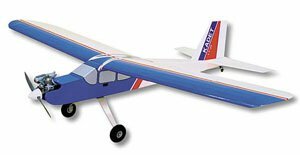 The biggest obstacle facing both the new and experienced electric R/C aircraft hobbyist is the selection of an appropriate power system. In the early days of electric flight, the difficulty arose from the limited availability of suitable motors and batteries, requiring careful optimization in order to get something to work at all. That has changed, but there are now so many choices covering a wide range of aircraft from indoor to quarter-scale. The problem now is one of choosing the appropriate components from the many available to best power one’s aircraft. MotoCalc was designed to automate much of this process. In 1997, it helped in designing optimal power systems using the few components available. Today, it does this and much more for the modeler faced with an overwhelmingly large selection of components. 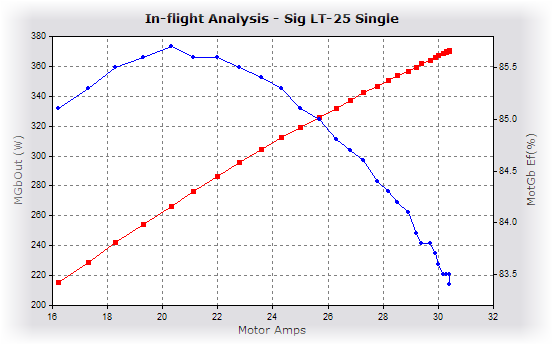 This article examines the problem of electric R/C airplane power system selection, and how to effectively use MotoCalc to solve it without the expense of a trial-and-error approach. 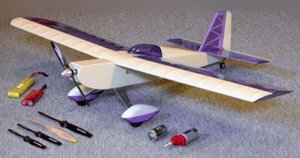 Selecting the appropriate motor, propeller, and battery for an electric powered model airplane can make all the difference between a model that will not fly, and one with stellar performance. Choosing the correct power system is not trivial, and must take into account the desired performance and the specifications of the airframe. Choosing from the many possibilities can make electric power system selection difficult. A modeler powering his or her plane with a glow engine has a simple job selecting a power system. Most glow kit and ARF models have a suggested range of engine sizes, expressed in terms of displacement. For example, a model intended for a .40 to .46 cubic inch glow engine will fly with virtually any such engine. Similarly, the decision of which propeller to use is an almost automatic consequence of the choice of engine. Internal combustion engines are maximally efficient over a very narrow range of RPM, meaning that there is a very small selection of suitable propellers. One simply uses one of the propellers recommended by the engine manufacturer. Using too large a propeller will bog down the engine. Too small and the engine will over rev. An electric motor has a much wider performance range. One motor can be used with many sizes of propeller. Larger propellers will cause the motor to draw more current and produce more power (to a point). Smaller propellers will draw less current, and produce more RPM. The same motor can be used with a small high-pitch propeller for a pylon racer, or a larger low-pitch propeller for a sailplane. Because of the smooth running characteristics of electric motors, it is also easy to attach an inexpensive and lightweight gearbox, trading RPM for torque. This further expands the range of usable propellers, and hence the range of aircraft for which the motor is suitable. Finally, there is the battery. This has often been compared with the glow model’s fuel tank, but that is a woefully inadequate analogy. The size of a fuel tank determines how long the engine will be supplied with fuel. The size of the battery determines this and many other factors. Using a larger battery may increase running time. Or, it may decrease running time while increasing the power available. The exact effect depends on the motor and propeller used as much as it depends on the battery. In short, the power system for an electric plane must be chosen as a system. One cannot choose a motor, propeller, battery, and possibly a gearbox in isolation. Because every choice of component affects the possible choices for other components, this can be a difficult and time consuming process. MotoCalc can do most or all of this work automatically, producing suggestions for complete power systems, predicting their performance, and allowing “what-if” analysis to optimize them further. The first step in choosing a model’s power system is to know what the plane is intended to do. The performance expected of a trainer is very different than that of a pylon racer. If we are flying 3D aerobatics, we will have very different requirements than those of an electrically launched Sunday afternoon sailplane. There are two main aspects of performance: the type of flying we intend to do, and how long we want to do it in one sitting. More aggressive flying requires more power. Longer flying requires more battery capacity. These two aspects of performance are at odds with one another, since more power means more drain on the battery, resulting in shorter flying times. Optimizing a power system to balance these two requirements can be a significant challenge. The characteristics of the aircraft play a large role in how it can and will fly. The most significant factors are weight, wing area, wing span, and airfoil (wing cross-section) shape. Higher weights require higher speeds or more wing area in order to remain airborne. Short stubby wings have more drag but are more maneuverable than long slender wings. Symmetrical airfoils fly as well upside-down as right-side-up, but require some up-elevator to maintain level flight. Thick wings provide more lift than thinner wings, but suffer from high drag at higher flying speeds. It is important to choose an aircraft suitable for the sort of flying we want to do. A two-meter sailplane will not make a good 3D aerobat no matter how good a power system we put in it. A pylon racer won’t be good for soaring regardless of how light it might be and how fast it can climb to altitude. The aircraft’s characteristics also influence the sort of power system that can be used. A large lightweight model can carry a heavier motor and battery than a similarly sized model that is heavy to begin with. A model with a large wing span can use a larger propeller without being adversely affected by propeller torque or looking out of proportion. Regardless of the motor, battery, and propeller eventually chosen, any airplane needs a certain amount of power to achieve a desired level of performance. One simply cannot get around the laws of physics. Because of this basic fact, a number of “rules of thumb” have been proposed based on a plane’s power to weight ratio. For example, it is suggested that a plane have about 40 to 60 Watts of power per pound (88 to 132 W/kg) of aircraft for typical “sport” type flying. More aggressive aerobatic flying requires about 70 to 100 Watts per pound (154 to 220 W/kg). Unfortunately, adequate power alone does not guarantee success. It is quite possible to put a 100 Watt power system in a one pound (450 g) airplane and still be unable to take-off. Or, the plane may be able to hover and climb vertically, but not fly horizontally fast enough to remain airborne. The power that moves an airplane is the product of two things: thrust and speed. The selected power system must provide these in the correct proportions if the plane is to be able to fly as intended. Too much speed and too little thrust can produce a plane that theoretically flies well at high speed, but is unable to accelerate to that speed in the first place. The opposite case will give that nice vertical climb without the ability to actually fly like an airplane. The goal then is to choose power system components that work together to provide the power we need, in the form that we need it (thrust vs. speed), for the type and duration of flying we want to do. There are literally billions of possible combinations of power system components, the vast majority of which are unsuitable for the task at hand. The trick is to find the right combinations. More often than not, the selection process is hampered by other factors such as price and availability. This requires substitutions of other components for the ideal ones, which in turn affects the choices of the remaining parts of the power system. Sig’s Kadet LT-25 glow trainer is an ideal candidate for conversion to an electric trainer. Photo courtesy of Sig Manufacturing. 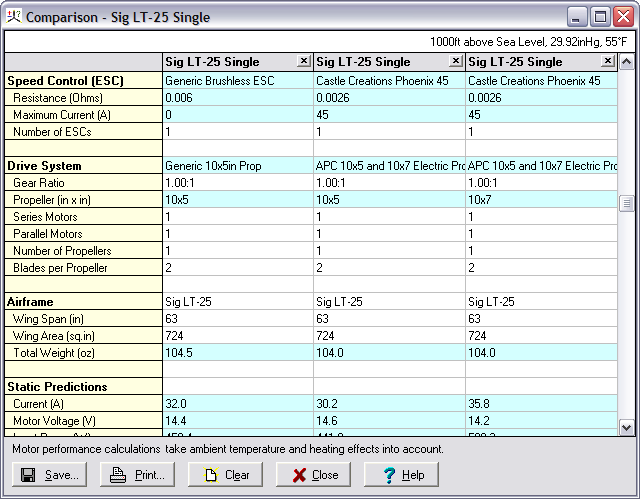 MotoCalc forms a substantial part of a complete power system selection and analysis solution. 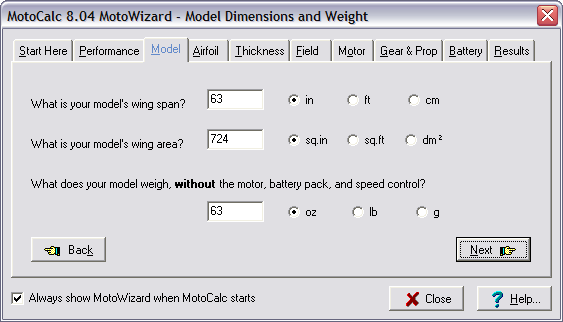 Starting with the MotoWizard, MotoCalc will suggest power systems for a model based on the desired performance and the airframe characteristics. 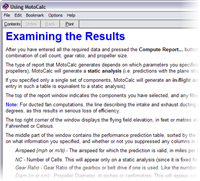 The MotoCalc Workbench then allows various systems to be analyzed in detail. Components can be changed to see what effect they have on overall performance. Different candidate systems can be compared side-by-side to show each one’s strengths and weaknesses. Graphs help to clarify relationships such as output power versus current or thrust versus airspeed. MotoCalc’s usefulness does not end once a power system has been selected. For instance, the ability to produce a wiring diagram eases the wiring of complex multi-motored models. After test flying, if the model is found to be deficient in some area, further “what-if” analysis can be done in MotoCalc to determine how to improve things most effectively. For the beginning electric modeler, the MotoWizard is the place to start. Using the MotoWizard requires virtually no knowledge of motors, batteries, propellers, and gearboxes. All one has to do is enter some information about the aircraft, desired level of performance, and approximate elevation above sea level, and the MotoWizard will do the rest. The model name that appears will be that of the project last worked on in MotoCalc. Since we want to run the Wizard on a new aircraft, we’ll click the Clear button, type in the name of the aircraft, and select the number of motors that it is to use. 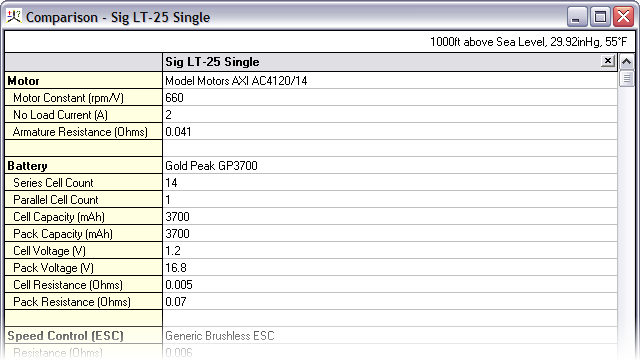 Since the LT-25 is a single-motor plane, we’ve selected 1 Motor. Here is where we’ll tell the MotoWizard what type of flying we wish to do with this model, and what typical flight times we expect. The LT-25 is designed to be a trainer, but it also makes a good sport model. And, since we would like to have flight times equivalent to its glow-powered cousins, we’ve selected Sport and 13 minutes as our goal. The Sport setting allows for some aerobatics, without the unlimited vertical that Aerobatic implies, or the hovering ability inherent in 3D Aerobatic models. The Model page is used to enter the basic specifications of the model: wing span, wing area, and empty weight. We’ll type the correct value into each of the three data boxes and select the appropriate units. It is important to enter the weight of the model not including the weight of the motor and gearbox, motor battery, and speed control. This is because the ready-to-fly weight will depend on the particular power system components selected, and these are not known yet. 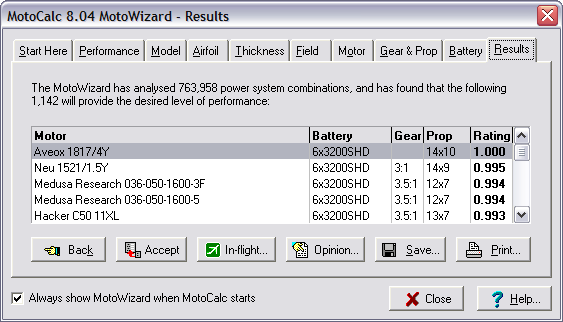 MotoCalc will automatically add on these additional weights as it evaluates potential power systems. If we don’t know the empty weight (e.g. you haven’t purchased the model yet, or haven’t built it), we can make a good guess. For a glow powered model, this is the published flying weight minus an estimate of the engine weight. Most glow engines weight about 20 ounces per cubic inch of displacement. For example, a typical .40 engine weighs about 8 ounces. At the top of the Results page is a brief summary of what the MotoWizard has done. In this example, it has looked at over three-quarters of a million possible power systems for the LT-25 in detail, and narrowed it down to just over a thousand good choices. The choices are presented in a table showing the suggested motor, battery, gear ratio, propeller size, and a rating. The motors can be any of the motors in MotoCalc‘s database for which the weight is known (all modern motors, and most older motors too). The Battery column shows the suggested battery. 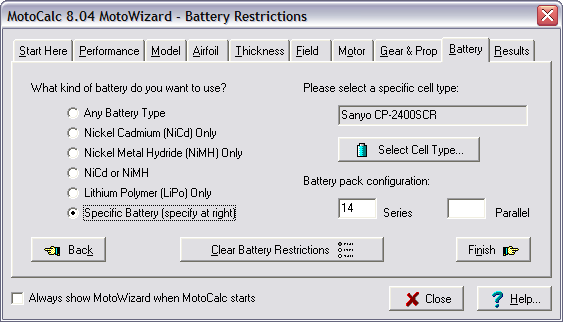 Unlike motors, the MotoWizard only looks at a small number of possible cell types, chosen to be typical of the types available. It combines these into batteries of varying numbers of series- and parallel-wired cells. 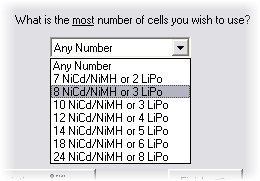 Each entry in the table is of the form NNxTTTT–MMP, where NN is the number of series cells, TTTT is an abbreviation of the cell type, and MM is the number of parallel cells. If the cells aren’t paralleled (i.e. “1P”), that part of the designation is omitted. The recommended gear ratio is shown in the Gear column. Here again, the MotoWizard doesn’t consider specific gear boxes, but only gear ratios. Any suitable gearbox with close to the suggested gear ratio can be used. For direct drive power systems, the MotoWizard leaves the Gear column blank. 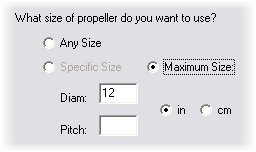 The Prop column shows the suggested propeller size. Like the gear ratio, these are generic sizes of no particular brand. The format is DDxPP, where DD is the diameter and PP is the pitch. Both are measured in either inches or centimetres, depending on whether you’ve configured MotoCalc for Imperial/US or Metric measures. The last column is the Rating, which gives a figure of relative merit for each of the suggested power systems. Please do not think of this as a percentage. For example, a rating of 0.5 is not only half as good as a rating of 1.0. Furthermore, the rating numbers from one run of the MotoWizard cannot be meaningfully compared to those of a different run. All of the suggestions displayed by the Wizard are the best ones it could find; the ratings just show which are the best-of-the-best. The results above show huge number of choices, but this is to be expected when the MotoWizard is given completely free rein. Fortunately, it’s fairly easy to narrow down the choices using the Motor, Gear & Prop, and Battery pages we skipped over before. We’ll start with the Motor page, by clicking on the Motor tab. The options on the left side of this page let us choose the category of motor we want to use. By default, any brushed or brushless motor will be considered. We can specify Brushed Only or Brushless Only to narrow down the choices. On the right side of the page, we can select a specific manufacturer to further restrict the choices to that manufacturer’s motors. Since we’ve already specified that we want to use Model Motors’ AXI series of motors and these are all outrunners, we’ll select Direct Drive Only (as one does not usually use gearboxes with outrunners). Notice that the Wizard has considered fewer power systems (2,498 versus 12,550 previously), but has produced more results (42 versus 27). This can happen when a restriction you impose (direct-drive and a maximum propeller size in this case) causes the MotoWizard to consider systems it might otherwise not have “thought” of. If we choose Specific Battery on the left side of the page, the right side changes to let us choose a specific cell type and the exact number of series and/or parallel wired cells. 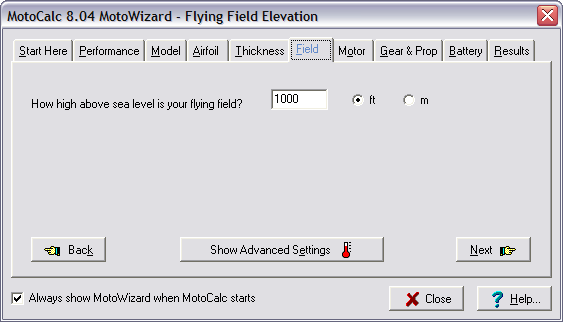 Like the propeller pitch and diameter fields, leaving either of these fields blank leaves the MotoWizard free to choose appropriate numbers. We can also leave both fields blank, thus specifying only the type of cells to use, but not the number. We’ve now narrowed our choices down to sixteen. If we have a lot of seven-cell NiMH battery packs on hand, the third choice is ideal, because we can use two packs in series instead of having to construct a custom large pack. The next step is to copy the desired power system to the MotoCalc Workbench to do a more detailed analysis, and possibly substitute components. To do this, we click on the desired result and then click the Accept button (just double-clicking on the result works too). In some cases, this message means that it is extremely unlikely that the desired level of performance is possible. For example, if you have selected Sedate performance but the empty airframe is very heavy, it may not be possible for the ready-to-fly weight to be light enough for Sedate flying. There are times however where several viable power systems exist but the MotoWizard is simply unable to find them. Out of necessity, the Wizard uses heuristics to narrow down the choices to at most a few million out of the trillions of possibilities before examining those in detail. If it were to examine every possibility in detail, the process could take weeks or months. The Workbench is the heart of MotoCalc. This is where we can perform a complete analysis of a selected power system (either one selected by the MotoWizard, or one we’ve chosen ourselves). But, the Workbench does more than this. In addition to predicting voltage, current, power, RPM, and other factors of power system performance, the Workbench will predict the performance of our plane using this power system. By selecting different motors, batteries, propellers, and gear ratios, we can use the Workbench to fine tune a power system. We can even generate predictions for several similar power systems at once, differing only in number of cells, propeller pitch, diameter, or gear ratio. The Workbench is divided into six main sections: Motor, Battery, Filter, Drive System, Speed Control, and Airframe. Each of these except Filter corresponds to one aspect of the completed airplane. We’ll look at the Filter section a bit later. The Airframe line shows you the wing area (as we entered it), but it also shows the ready-to-fly weight (“109.4oz RTF”) and the wing loading (“21.8oz/sq.ft”). The remaining information (“Cd=0.063; …”) is detailed aerodynamic data which we can ignore unless this is of interest to us. The Stats line gives a lot of useful information, starting with the input and output power loading (“64 W/lb in; 54 W/lb out”). The input power loading is the figure often referred to in the Watts-per-pound rule of thumb, and 64 W/lb is more than adequate for sport flying. Next we have the stall speed (“22mph stall”). This is the speed below which the aircraft will not fly. After this is the optimal flying speed, required throttle, duration, and predicted motor temperature (“29mph opt @ 58% (33:11, 85°F)”). Technically, optimal flying speed is defined as flight at the speed and power level giving the longest duration (for you full-scale pilots, this is the “best endurance” speed). It’s not necessarily much fun to fly at that speed, but it is a good figure for comparison. The information shown for our LT-25 gives an optimal speed of 29mph at a 58% throttle setting, giving a duration of about 33 minutes, with a resulting motor temperature of 85°F. Next is the level flight speed. MotoCalc defines this as the speed at which the plane will maintain level flight with a neutral elevator setting. For our LT-25, this is 34mph at 63% throttle, with an endurance of 28 minutes. The motor will reach 88°F during such a flight. This may seem like an unusually long endurance, but keep in mind that this is only achievable if we launch into level flight, never climb, and never turn. Again, it is a useful figure for comparison, not an absolute prediction of performance. Finally, we have two more figures giving the maximum rate of climb and the angle of climb at which that is reached, and the corresponding figures for minimum rate of descent in a glide. Comprehensive on-line help is available at the touch of a button. The main part of the report shows predictions for every aspect of power system and aircraft performance over a range of airspeeds, starting from zero (i.e. 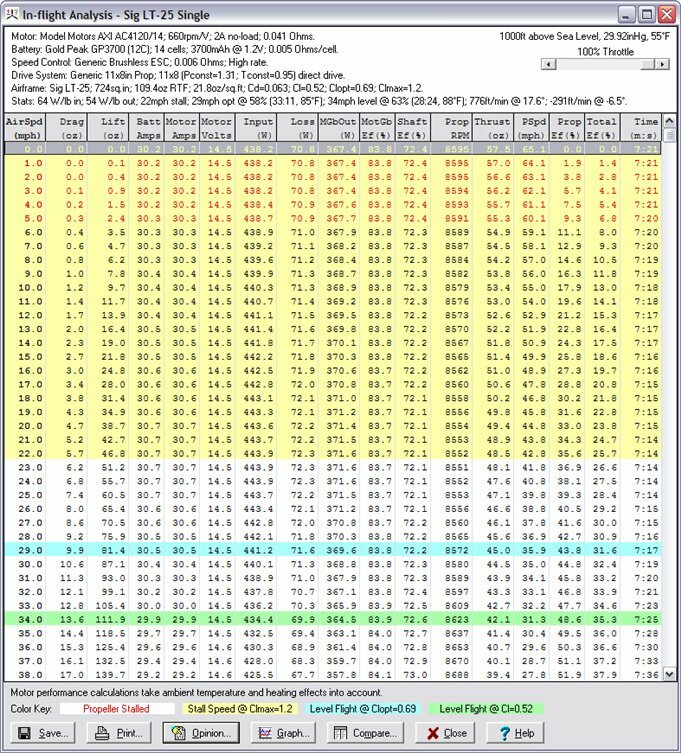 static conditions) up to the maximum attainable level flight speed (it’s usually necessary use the scrollbar or enlarge the window to see the entire report). Color coding is used to highlight important speeds and speed ranges. Speeds below stall speed are highlighted in yellow. The optimal and hands-off level flight speeds respectively appear in blue and green. Red text indicates that the propeller is aerodynamically stalled, which is only an issue if this occurs at speeds close to the expected flying speed. For detailed explanations of all the report columns, we can click the Help button at the bottom of the report window, or press the F1 key. MotoCalc has very comprehensive on-line help available throughout the system, just a click or keypress away. Notice that there are now two columns in the Comparison window, and that some of the rows have a light blue background shading. Each column corresponds to one of the power systems, and the shading indicates where there are differences between the columns. We can continue to add power systems to the Comparison window in the same way, up to a maximum of ten columns. Clicking the X in the top right corner of a column removes that column from the comparison. Columns can also be dragged around to rearrange them, a feature familiar to spreadsheet users. 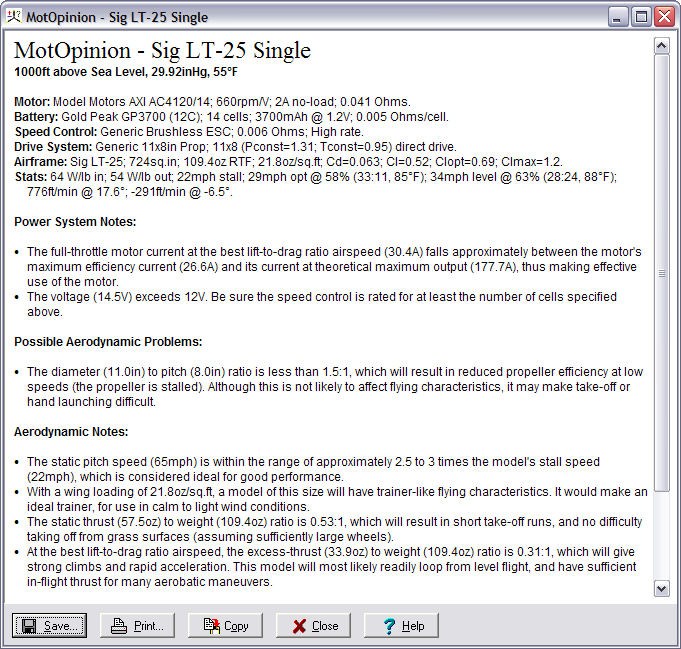 So far, we’ve used the MotoWizard to automatically choose some possible power systems for our Sig Kadet LT-25, the MotoCalc Workbench to analyze them, the MotOpinion report to understand them, and the Comparison window to compare them. Now, some fine tuning is in order. Let’s start with the second power system we selected (AXI AC2826/10 motor and 10×5 propeller). If this system isn’t already on the Workbench select it on the MotoWizard Results page and click Accept. The first area to address is the propeller, which is specified in the Drive System section of the MotoCalc Workbench. Change the Description to “APC 10×5 and 10×7 Electric Props”. In the “to” and “by” parts of the Propeller Pitch field, type “7” and “2” respectively. Select “APC Electric Average” from the drop down list in the P.Const field. This will change the number in that field to 1.17. 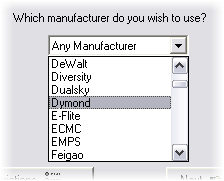 Select “APC” from the list in the T.Const field. This will change the number in that field to 1. Finally, we click the Save button (at the bottom of the Drive System section). This will save these propellers into the database so we can retrieve them later for further experimentation. The other thing to change is the Speed Control. Once again, the MotoWizard has selected a “generic” model, and we need to choose a real speed control. Referring back to the Comparison window, we see that the predicted current (under Static Predictions) is 32 Amps, so we need a speed control that can handle at least that much. Furthermore, we need a brushless speed control. Let’s use the Castle Creations Phoenix 45 to give us plenty of safety margin in current handling capability. MotoCalc‘s database comes pre-filled with a large number of commonly used speed controls, so all we have to do is click the Open button at the bottom of the Speed Control section, and select the “Castle Creations Phoenix 45” from the list of available controls. This report is very similar to the in-flight analysis, except that all calculations are done for zero airspeed (static) conditions. The reason we did not receive an in-flight analysis is because we indicated that we wanted to try two different propeller sizes. So, this report has one line for each propeller size. We can get a separate In-flight Analysis for each line in the Static Analysis by selecting that line and clicking the In-flight button (or, by double-clicking on the line). Notice that the current is lower for the APC 10×5 than for the generic 10×5 propeller. This is because of its above average efficiency. The current for the 10×7 propeller is signficantly higher. Going back to the Static Analysis window and asking for a MotOpinion report on each of the two propeller options, we conclude that the APC 10×5 is the better choice. A picture is worth a thousand words, and probably at least that many numbers. MotoCalc features an extensive graphing facility to help in visualizing different aspects of power system and aircraft performance. There are literally thousands of different graphs that can be generated, so we’ll only touch on a few of them here. 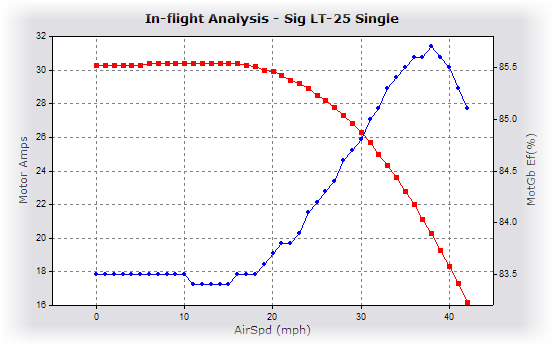 In the graph above, we can see that efficiency ranges from about 83.5% at low airspeeds to almost 86% at flying speed. With a less efficient motor, or one poorly suited to the model, we might see a wider range of efficiencies. The propeller RPM starts out at about 11830 at zero airspeed, drops a bit as speed increases, and then increases rapidly after about 20mph. The two vertical axes will show motor output power and motor efficiency respectively (the “Gb” stands for gearbox, because these values include gearbox losses if a gearbox is being used). These values are being plotted against Motor Amps, so the graph shows at a glance that the maximum efficiency for this motor with 14 NiMH cells occurs at just over 20 Amps, and that the maximum output power occurs somewhere past 31 Amps (the graph doesn’t go further than this because the motor will never exceed 31 Amps with the battery, propeller, and airframe we’ve teamed it up with). 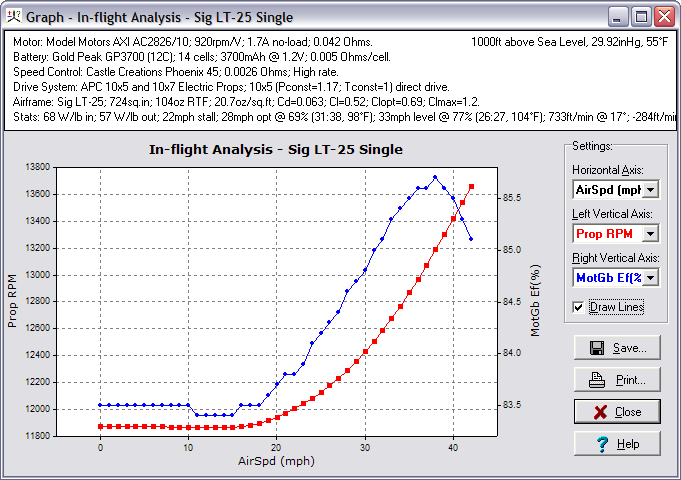 There are many more possible graphs that MotoCalc can produce from an In-flight Analysis. We can select any column of the report for any axis of the graph. A single-motored model like the Kadet LT-25 is quite simple to wire, but multi-motored models, for which electric power is especially well suited, can be more of a challenge. 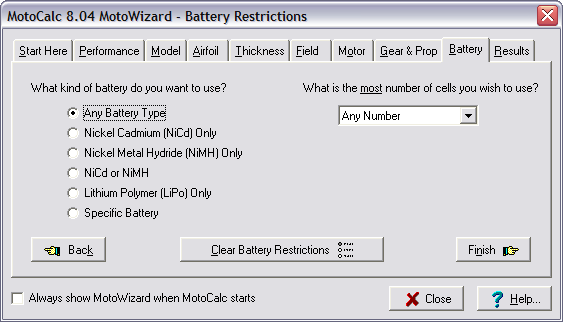 MotoCalc’s Wiring Wizard takes the guesswork out of it. To illustrate this, let’s return to the MotoWizard, navigate to the Start Here page, and select the 3 Motors option. Then we’ll go to the Results page, select the first recommended power system, and click the Accept button. Back on the MotoCalc Workbench, we can open the Wiring Wizard by clicking on its button (the one to the right of the “wizard hat”), or selecting Wiring Wizard from the Project menu. A diagram like the one below will appear (if you see a “Not Possible!” message, make sure the Number of ESCs field on the Workbench is set to 3). The red “ F ” represents the fuse. 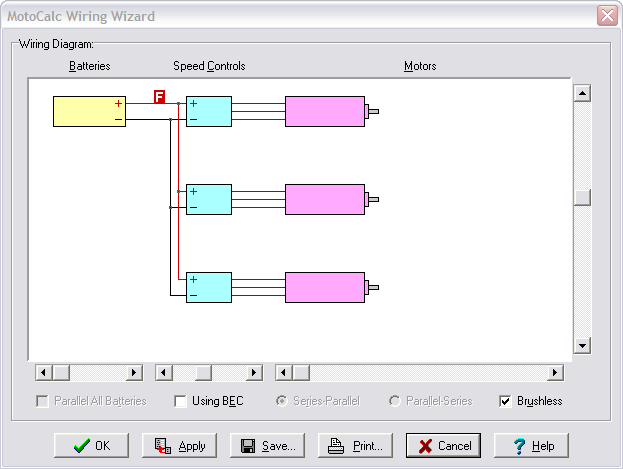 You can experiment with wiring diagrams for more complex configurations (up to 6 parallel batteries, 6 speed controls, 24 motors, with and without BEC) by adjusting the sliders and check boxes in the Wiring Wizard window. New motors are being introduced almost daily, and new cells and speed controls almost as often. Capable Computing, the makers of MotoCalc add new data to MotoCalc’s database on a regular basis, and it’s easy to add this data to an existing copy of MotoCalc. Just select Update All from the Update menu of the MotoCalc Workbench. MotoCalc will then automatically connect to Capable Computing’s web server and download the latest data into the database. Checking off the desired items and clicking the Add Checked Items to MotoCalc button will download those items into the database. So far we’ve just touched on the basics of how to select and analyze an electric flight power system using MotoCalc. As you become more familiar with the program, you’ll discover its many advanced features. Here are brief introductions to just a few of them. 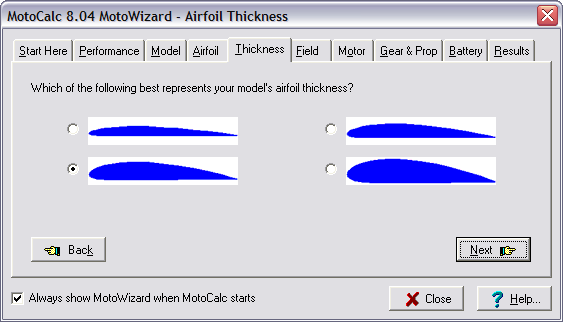 The Filter section of the MotoCalc Workbench is an extremely powerful tool for the veteran electric modeler. As you gain experience with electrics, you’ll learn many rules of thumb about what does and does not make a good power system for a particular plane. For example, one such rule states that propeller pitch speed should be between 2½ and 3 times the aircraft’s stall speed. 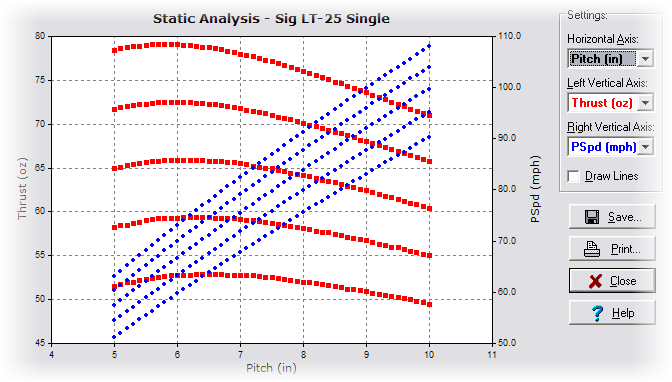 Because MotoCalc can generate a Static Analysis for many power system combinations at once, the Filter section is useful for removing those setups that don’t meet certain criteria, such as the pitch speed rule above. For example, if you’ve entered a range of propeller diameters going from 9 to 12 inches, pitch going from 5 to 10 inches, and number of cells ranging from 10 to 16, MotoCalc would produce a Static Analysis for 168 different setups. By setting a Filter to restrict pitch speed to the range of 51 to 64mph, thrust at least 35oz, and full throttle run time at least 300 seconds (5 minutes), the number of setups is reduced to 9, which can then be analyzed in more detail (e.g. producing an In-flight Analysis or a MotOpinion report). 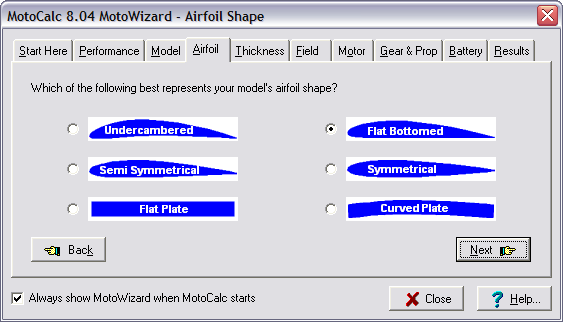 Here you can give MotoCalc a better idea of your model’s airfoil, either by entering the parameters directly using the sliders, from measurements taken from the model or plans, or from a list of common airfoils. The options at the right side of this window are used to tell MotoCalc about the factors influencing the drag of your model (which affects top speed, best rate and angle of climb, endurance, and so on). If you like to buy the latest motors, for which data is often unavailable, or if you enjoy building or modifying your own motors, you will want to be able to determine the motor parameters so that you can use MotoCalc to make predictions about these motors. 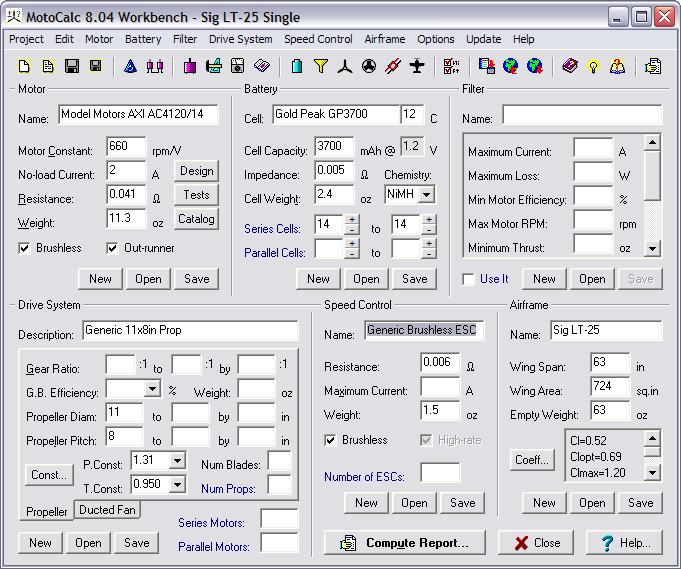 You may have noticed three buttons in the Motor section of the MotoCalc Workbench labeled Design, Tests, and Catalog. The Design button opens a window where you can calculate the effects of changing the windings of a motor. Given one motor whose parameters and number of windings are known, this window will predict the parameters for a second motor that is identical except for the number of windings. 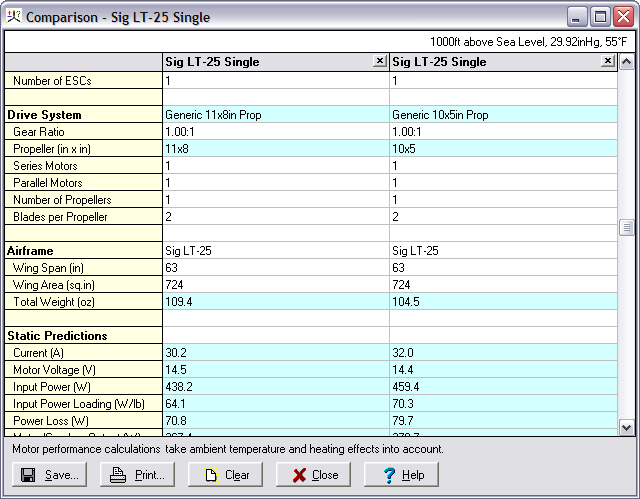 To determine motor parameters from motor bench tests, click the Test button. This will open a window where you can enter two data points for which you’ve measured voltage, current, and RPM. You have a choice of providing free-running and under-load data, or best-efficiency and one other data point. The latter choice is useful if you have dyno data for your motor. Finally, the Catalog button opens a window where you can enter everything you might find about a motor in a supplier’s catalog. If possible, MotoCalc will then determine motor constants from this. 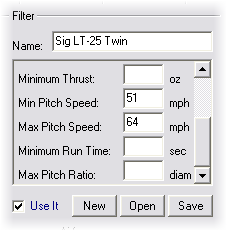 When we tuned the power system for the Sig Kadet LT-25, one of the first things we did was select new values for the P.Const and T.Const fields in the Drive System section of the MotoCalc Workbench. The drop-down lists for these fields contain many popular ranges of propellers, but if you have a propeller that isn’t on this list, it’s possible to determine these constants yourself. This will require an accurate thrust measuring stand along with the ability to measure voltage, current, and RPM. You’ll also need a motor whose parameters are precisely known. Just click the Const button in the Drive System section of the Workbench to open the Propeller Constant Estimator, and enter the test data. 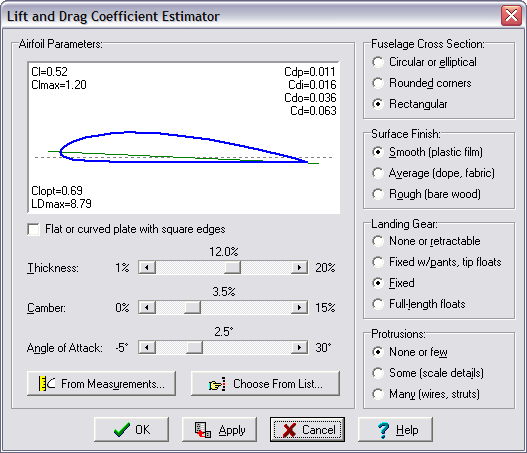 With this information, MotoCalc can estimate thrust and power constant values for the propeller being tested. MotoCalc has many options to let you customize it to your preferences, such as the units of measurement you prefer (US, metric, or a mixture), and which columns to display on the Static and In-flight Analysis. One option tells MotoCalc whether or not you want it to take into account the effects of motor heating on motor performance. All motors waste some percentage of their input power in the form of heat (the Loss column on the Analysis reports). As the motor runs, it gets warmer until it reaches equilibrium, which is the temperature at which it transfers heat to the atmosphere as fast as it generates more. MotoCalc can estimate this steady-state temperature, and adjust the motor parameters during the calculation to reflect the changes caused by the high temperatures. Why might you not want to do this? In aircraft where the motor is only run for short periods of time, or is usually run at low throttle levels, it will never get that hot. The same is true when test running a motor for brief periods on a test stand. In cases like these, ignoring the effects of heating will give more accurate results. MotoCalc is the only general purpose electric flight modeling program that can predict ducted fan performance. When you click on the Ducted Fan tab in the Drive System section of the MotoCalc Workbench, input fields for fan drive systems appear. There are only a few fans in the database because accurate data for these is hard to come by. However, there is a Fan Coefficient Estimator to help you determine the appropriate coefficients for a fan you have on hand (or have test data for). This article has not described every feature of MotoCalc in detail. To do so would require well over a hundred pages, which in fact, is about how long the MotoCalc manual is when printed out. The manual is a detailed reference for all of MotoCalc‘s features. It is available on-line in HTML or PDF format, and if you’ve purchased a MotoCalc CD, a copy is included on the disk. All of the information in the manual can also be found in the on-line help. Clicking the Help button or pressing F1 almost anywhere in MotoCalc will immediately display the relevant information. Your MotoCalc purchase also includes free e-mail technical support. If you fly electrics at any level beyond a fly-it-out-of-the-box ARF, you need MotoCalc. Although there are other electric flight calculation programs available, none are as easy to use and comprehensive as MotoCalc. MotoCalc also features detailed on-line help on all aspects of the program and free e-mail technical support. Best of all, you can download it and try it free for 30 days. If you wish to print this tutorial, you may find the PDF version more suitable. Is there a version of Motocalc for Linux operating system ? Thanks a lot for this site and your works, it’s awesome ! No, but it works fine under WINE.